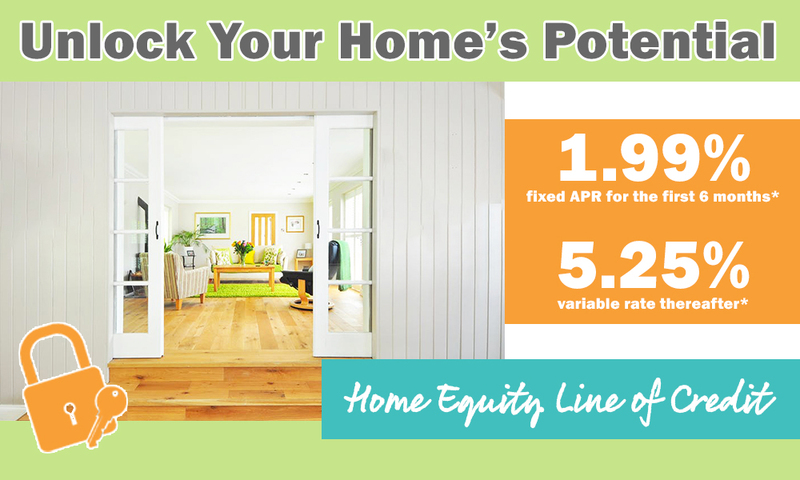 Our Home Equity Loan is a valuable resource where you have a revolving line of credit secured by the equity you have in your home. You can use this loan for home improvements, to consolidate bills, pay school tuition, for that dream vacation, or any other good purpose. Limited time offer. Rates, terms & conditions effective as of 11/14/2018. Rates, terms & conditions subject to credit approval. Property insurance required. Other restrictions may apply, see bank for details. Offer eligible for new loans; existing HELOC with a maturity/renewal date 9 months or less from application date; or an existing HELOC that increases its line of credit by at least 50%. Minimum line of credit $10,000. 1.99% fixed introductory rate in effect for the first 6 billing cycles. Thereafter, a variable rate based on The Wall Street Journal prime rate plus a margin, currently 5.25. APR is based on a LTV of 80% or less, may be higher depending on certain credit factors. Max APR is 21%. $50 annual fee waived for automatic payments from a The Peoples State Bank deposit account. LTV is based on The Peoples State Bank approved valuation method. Closing costs may apply if an appraisal and/or title insurance required. Balloon payment may be required to pay this loan in full. Minimum monthly payment equal to the interest that accrued on the outstanding balance during the preceding billing cycle. Balances less than $25 must be paid in full. If the line is closed within 3 years the prepayment penalty fee is the lesser of 2% of principal balance or $350.